Upon reading the above quote in When God Spoke Greek on the penultimate page of chapter 4, some readers may be tempted to feel a certain level of dissatisfaction with Law. Why does he refuse to provide something more concrete? Can we not say anything more definitive about the origins, purpose, and authors of the Septuagint (NB referring to the Greek Pentateuch)? ... and I am very pleased with Law that he did not attempt to do so. He even admits on page 42 how attractive an explanation like "religious purpose" would be, but Law, being a responsible scholar, must follow the evidence — or in this case, must not say more than what the very little evidence we have allows. In this chapter, Law helpfully discusses key issues on the origins of the Septuagint. He begins by providing a brief historical background, explaining to the reader that the science and art of translation had been around well before the creation of the Greek Pentateuch. From there, he moves to the Letter of Aristeas. This letter, likely written around 100 years after the translation of the Pentateuch, is well known for its claim to give an eyewitness account of the event and events surrounding the translation of the Torah into Greek. Law's discussion here is helpful. He offers a critical assessment of the Letter, suggesting its use as a "charter myth" (38) within Hellenistic Judaism, while also remaining open to the idea that there may be pieces of historical merit present. The most important take away for Law, though, is the purpose of this narrative to affirm the authority of the Septuagint. Law's discussion here is excellent, briefly diving into the two avenues through which such authority is affirmed: via Greek perspective (King Ptolemy II's insistence that the Jewish law be included in his library; the translators described as being on equal footing with the Greek philosophers; the description of the reasonableness of Jewish laws) and via Hebrew perspective (translators selected by the high priest; thematic links between the Letter and the book of Exodus). There is not space to explore these avenues in detail here, but Law's few pages are a worthwhile read. Crucially, as Law notes, this all paved the way for a very high view of the Septuagint, that is, it being regarded as sacrosanct and at least on par with its Hebrew source, if not placed above it! The final two sections of the chapter are titled "Who Were the Translators?" and "Why the Septuagint?" Law is cautious in both of these sections, particularly the latter, to not overstate his claims. We have very little evidence to provide definite answers to either of these questions. Law ends the first of these two sections with the following: "All the evidence seems to point to moderately educated, Hellenized Jews in Alexandria. Unfortunately, certainty escapes us" (40). Though I am sure many would prefer Law to make a more concrete claim, I am thankful that he does not. This is an important lesson that all scholars must learn. We must follow the evidence and never claim more than it claims and never suggest more than it suggests. Even the few suggestions that Law does put forward in this section are up for debate. He privileges the use of Egyptian load words, claiming that they "reflect the common vocabulary used in an Egyptian setting even by immigrants" (40). To this, I would say, "Maybe." To turn around Law's own analogy of an English speaker living in Mexico who will refer to an enchilada whether in Mexico or back home in an English context: I used the word "enchilada" and I have never lived in Mexico! My wife and I will frequently use "lo siento" and "te amo" when speaking to one another despite neither of us living in Mexico or being of Mexican or Spanish descent. The use of loanwords does not necessarily indicate the location from which one is speaking or writing. All they absolutely indicate is some contact with the culture and language, which may be very indirect and removed. 1. My brother will refer to Mt. McKinley (tall mountain in Alaska) as "Denali" (the native Alaskan name for the mountain). My brother has never lived in Alaska, so why does he not use the normal American designation for the mountain? Because I lived in Alaska. Because of his connection to me, he knows that Alaskans prefer the original, native name rather than using the name of a US President who never even visited their state. His use of "Denali," then, does not indicate his location. He lives halfway across the world from Alaska. All it indicates is an indirect connection to a location and culture. 2. Although my American parents only lived in Norway for a handful of years and have not lived there for over 23 years, my mother will still say to this day "forstår du meg?" ("Do you understand me?") when she wants to communicate "You had better agree or you will be sorry." If she were to write this in an email to me, it would not indicate she was writing from Norway. Rather, it merely indicates a past connection to Norway. Granted, we live in a more interconnected world and people are much more mobile these days. I merely want to show that Law does very well to be cautious in this section and that even loanwords can be misleading. In the last section, "Why the Septuagint," Law provides an even more cautious discussion, to which the quote at the beginning of this blog post attests. 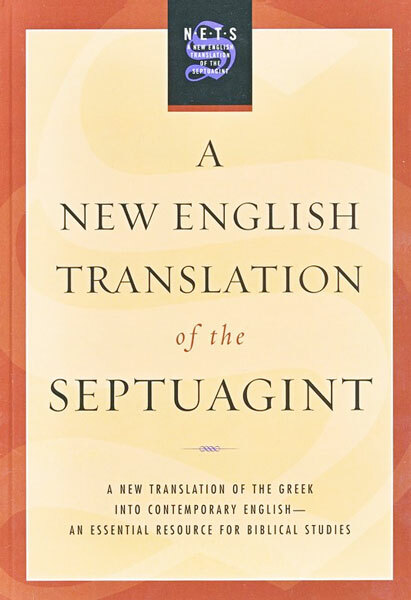 We cannot say with any certainty why the Septuagint was translated. There have been many good and creative ideas put forth in recent years, but none can claim to have enough evidentiary support. Law only singles out one of those ideas, the Interlinear Paradigm (which is perhaps the most popular), and briefly discusses it (41). I especially appreciated his assessment. In my opinion, the Interlinear Paradigm, which posits that the Greek translation was produced with the idea that it would be read side-by-side with the Hebrew, is incredibly problematic. Law does an excellent job here of respectfully and briefly noting the Paradigm's weaknesses yet allowing that it may be helpful in certain contexts. While the reader may come away from chapter four feeling discouraged or dissatisfied owing to the lack of certainty we can have about the origins of the Septuagint, this is not the end of the book! We are just getting started! Furthermore, if Law had made concrete claims in this chapter, I would have recommended everyone to just put the book down and walk away! The fact that Law is honest and cautious here is a good indication of his desire to follow the evidence and not go beyond it. Chapter four of Law’s book is a stimulating introduction to a very interesting topic, the translators of the LXX (Torah). I do not say the chapter is stimulating because I disagree with the contents of the chapter. In fact, after reading the chapter twice I realized I had no question marks in the margins of this chapter in my copy of the book, and I normally place question marks in the margin where there are things that I have reservations about. I agree with Chris that in this chapter Law is cautious, and he does not go beyond the evidence. However, I found the chapter stimulating because it introduces several topics related to the Greek Bible that virtually beg for further inquiry, and it inspires me to get to work. Let me mention a few of the topics introduced in this chapter that need more work and are ready and waiting for scholars to study them further. First, for the uninitiated as well as the initiate the Letter of Aristeas is a deep hole that could swallow up the scholar who dares to jumps in; yet anyone interested in Septuagint studies must take this plunge, whether they decide to stay in the water long or not. A lot of work has been done on Aristeas, but I think there is still a lot more to do. Also, the Interlinear Paradigm, which Law refers to in the last section of the chapter, has not been applied to Greek Bible studies very long and it is begging for more analysis and critical evaluation. The study of the rhetoric and style of the various books of the Greek Bible is one entrée into this analysis. Other areas of study of the Greek Bible that are worthy of further research and come to mind from this chapter are the study of translation theory and work on translation technique in the various books and sections, and all these fields of inquiry will help us have a better understanding of the translators of the Greek Bible. Thus, I found this chapter stimulating because it reminds me how much we do not know about the Greek Bible and how much more work there is to be done in it. There is great interest in Septuagint (Greek Bible) studies, and there is no danger of running out of work to do on it. Chris accurately observes the tone behind this chapter. Caution. For me, Law's warranted caution is needed for the reasons Ed and Chris point out. Either the answers are not concretely presented to us in the evidence, and thus our conclusions should also be held loosely. Or, as Ed put more clearly, there is still a lot of work to do. I think all three of us (without making this a mutual-admiration society) would like to believe that there is more work! Job security! Though, I am primarily intending to respond to Ed and Chris, I found one point to be especially interesting that has not already been pointed out. Chris noted how Law says that the Letter of Aristeas (LA) was a "charter myth" that served to establish the authority of the Septuagint for the Alexandrian Jews. How this "myth" was established was what I found interesting. Law notes that "LA rewrites the Exodus." (36) For LA version of the Exodus, the Alexandrian Jews were freed from a "willing liberator," Ptolemy II Philadelphus, and then these Jews receive, not the law at Sinai, but the Law in Alexandria, in their own language (broadly speaking), Greek. This story, Law says, was "used to bolster the authority of the Septuagint," and in time "[Some Jews and Christians] would believe it was indeed a new revelation from God." (36, 39) OT, Early Jewish, and NT scholars are used to seeing this same Exodus motif employed for similar reasons seen in LA. It is not a new narrative (propaganda?). Re: the interlinear model. I am glad Law spoke on this. I am also glad that Ed responded to Chris the way he did. I think I generally find myself in the camp that I perceive Chris and Law to be. That is, largely in response to my MT-heavy theological education, I want something more purely LXX. Ed's comments on the infancy of research on the interlinear model gave me pause. I think I was so sold out (though I think I still sort of am) to the idea of treating the LXX in its own right, I may have forgotten the value that this other perspective could provide. LXX research broadly is still in its infancy, and has been slowly (very slowly) gaining steam for over100 years in modern critical research. This recent push by Law, Jobes, Tov, Ed, Pietersma, Gentry, Wright, et. al., and future stakeholders like Chris, has shown to the rest of us how much still needs discovered. And at this stage, no rock should be left unturned, even the ones we may not initially be drawn to. Hi fellas. I appreciate the review of chapter 4 and the subsequent interaction. I have two comments. First, Chris, I appreciate your emphasis on how we need to pay attention to the evidence and only go as far as it goes, and I think we all try to do this. But sometimes it sounds like you are speaking of evidence with almost a brute facts or self-interpreting kind of discourse. Please, clarify this point for me because I'm pretty sure you would not admit to this. All evidence requires interpretation, even the selectivity of evidence requires interpretation and discernment. In other words, we are all drawing inferences from the same evidence and there is more involved in that jump than simply following the evidence. Law, on page 42, shows this. How do we know the Torah was translated first because it was the "unrivaled authority" and not simply because of "a new literary consciousness"? I agree with Law, as I suspect most probably would, but that would then indicate that the Jews in Alexandria were not simply interested in a secularistic program of translation to provide themselves with literature but were fully conscious of their need of access to their authority in order to navigate Hellenism's waters. Once they possessed their authority for living, they would then need their authoritative liturgy contained in the Psalter. And on and on it went. Second, I'm part way through J. Ross Wagner's Reading the Sealed Book, and he seems to favor the Interlinear paradigm even in a book like Isaiah (I have not yet finished it so if he turns the tables later in the book let me know :)). Wagner no where talks about Interlinearity as a purpose for the LXX. Rather Wagner and others I have read and heard on it would appeal to this paradigm as a model for describing translation primarily. If there is value for determining the origins of the LXX via Interlinerarity, I think we are still waiting for it. Wagner surveys Boyd-Taylor's work and with few exceptions appears to be in line with it. Of course, Interlinear, as a model, will be better suited for some translations than others, but Boyd-Taylor has even treated books like Job and has shown the helpfulness of the model. Thanks for continuing this conversation and for letting me troll along with you all :). Thanks very much for your comments and interaction, John. Regarding your first comment, yes, you are correct, I would not admit to such a thing! And I think you are right to push back on the way I wrote about it. For me, I think I was reacting to some of the Septuagint scholarship I have read that tries to go far beyond where the evidence leads regarding origins, translators, geography, reasons behind the translation, etc. So, yes, I completely agree with you that all evidence requires interpretation, absolutely, full stop. I just think that some scholarship takes a few too many liberties with their interpretations or are too confident in them. I am fine with scholars postulating this or that date, this or that location, this or that translator(s), but sometimes it seems that 1) the conclusions do not necessarily follow from the data or 2) it is forgotten that while the data could suggest such things, it could also be interpreted in other ways. Regarding Law's comment on 42, that's just it. We don't know! And I think we have to keep that in mind. Especially having heard Jim Aitken's thoughts on a new literary consciousness myself, I must at least concede that the data can be interpreted in a variety of ways, all of them convincing in their own right, none of them carrying so much necessity as to win out over the others. The problem in Septuagint studies is we just don't have enough evidence outside of the text itself. It would be phenomenal if some translators had written down prologues to their books, like we find in Ben Sira, or if some Egyptian religious document talked about these Greek translations of the Jews, but we just have the text, Aristeas, and then its appropriation in the NT and early church. And, "Typologically, I would see the development of the Septuagint in four stages: (a) the Hebrew text as sole authority, (b) the Greek as crib to study the Hebrew, (c) the Greek text as independently authoritative, (4) the debate over the relative authority of the Hebrew and the Greek." TL;DR: Pietersma writes that the Greek text is subservient to the Hebrew, emphasizes the unintelligibility of the Greek, states that if reading the Greek, the Hebrew had to be consulted for some essential linguistic information, and posits a school atmosphere in which the Hebrew text was the object of study and that the Greek translation was created in order to be a crib sheet for that study. Moreover, even with the current iteration of the Interlinear Paradigm, I still find it to be problematic and unnecessary. This is not the time or place to unpack it all, but I can at least take solace in the fact that there are fantastic scholars out there (Joosten, Bons, Dines, Aejmelaeus, to name a few) who are engaged in Septuagint scholarship and translation and who apparently feel no need to appeal to the model. Ok, I have written way too much and have stayed too late at the library! Is any of that helpful, John? Let me know your thoughts and do feel free to push back. Thanks, Chris. Your 2) in the first paragraph is the key. Really, we are back to proposing the more probable of options, which is still to affirm that all sides are following the evidence but drawing different conclusions from it. The ditch on the other side is equally to be avoided: radical skepticism, that is, the current evidence leads nowhere. One's presuppositions and assumptions play a role in interpretation of the evidence as well. If you have suggestions from Jim's materials on new literary consciousness that I should read, I would be glad to look at them. I won't defend interlinearity as a theory for origins. It's not a suitable model to answer that question in my mind. I think it's a helpful model of translation description. Also, if you can make sense of the συν for את along with a developing concordance principle for translation equivalents in Greek Ecclesiastes, I would gladly hear your solution. I think we need to be prepared to handle both tendencies (extreme isomorphism and functional equivalence TT) in the corpus. Thanks again for the dialogue. Thanks for this installment, everyone. This is an important chapter that sets the tone for the rest of the book, as you suggest, Chris. I find myself in agreement with most of what Law posits in the chapter, particularly with reference to limited evidence for LXX origins, and the stylistic aspects of the LXX. The Interlinear paradigm has weaknesses, like others have pointed out, and I think more attention needs to be paid to the LXX as a freestanding document overall. A new translation in that vein would be a great project! I'll also mention that I look forward to others' thoughts on ch. 5 where there's a bit more juicy material. It seems to me that aspects of ch. 4 partially argue against some of Law's suggestions in ch. 5, but I'll wait to dive into that until next time.